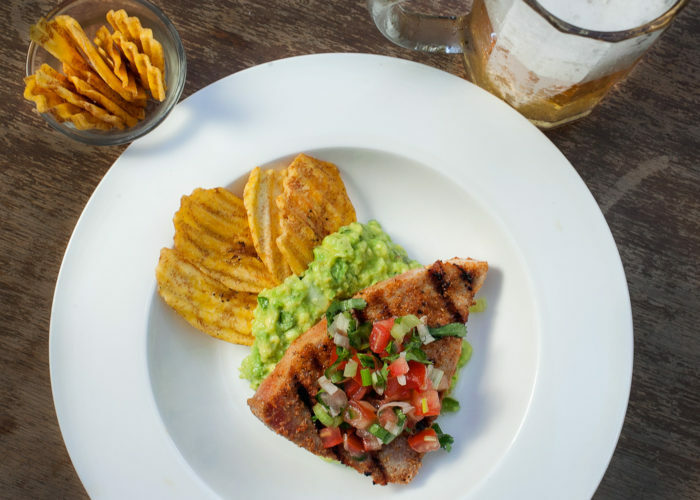 These grilled yellowfin tuna steaks get a crunchy and flavorful boost from crispy plantains layered with guacamole and fresh salsa. When I hear the word tuna, I think sandwiches or salad, right? But when I hear the words grilled tuna steaks, you have my full attention. I think people are still on the fence and undecided on whether they will try tuna steaks. Trust me when I say it's nothing like eating tuna out of a can. It's mild, melts in your mouth, and so delicious paired with fresh guacamole and salsa. 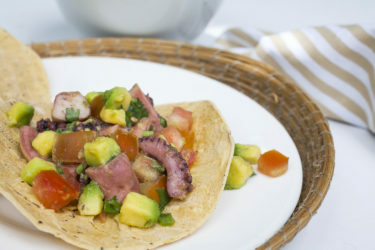 If you've never had a tuna steak taco, you don't know what you are missing! I had recently come home from a trip to Miami after attending Hispanicize and I was inspired by all the delicious Cuban, Peruvian and Colombian dishes I had tried. I was especially enjoying the fried green plantains I had in various ways. My favorite was patacones, also called tostones. They are twice-fried green plantains that almost remind me of a potato, just more starchy. At this particular Colombian restaurant, the green plantain was smashed so thin and wide, it covered the entire dinner plate. I wasn't feeling that ambitious yet, so I thought I would start off small. Here's the result of my inspiration from my trip to Miami! In a separate bowl, combine all of the ingredients for the tomato salsa. Taste for salt. Cover and set aside. Preheat 1 cup of canola oil to medium heat for 6-7 minutes. After a few minutes, score and peel the plantain. Slice in half horizontally. Fry in hot oil for 5-7 minutes. Transfer to a plate lined with paper towels to drain. Let cool for a minute. Place plantain onto flat surface. Using a flat bottom plate or pan, smash plantain as thin as you can without tearing it apart. Fry once again for 2-3 minutes. Transfer back onto plate. Season with salt and pepper. Preheat outdoor grill to medium-high heat for 5-7 minutes. In a small bowl, combine salt, pepper, paprika, cumin and garlic. Season both sides of the tuna steak. Once grill is hot, drizzle the tuna with olive oil and brush grates on the grill with a little oil as well. Grill the fish for 3-31/2 minutes per side. Remove from grill onto plate and tent loosely with foil paper. While tuna is resting for a minute, warm the patacones for 30 seconds on the grill. To plate: add one crispy plantain to plate. Add a generous layer of guacamole. Place tuna on top of guacamole and garnish with tomato salsa. 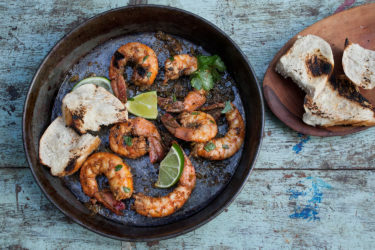 Serve with lime wedges and a side of your favorite rice and beans. No outdoor grill? Enjoy your grilled tuna steak using a stove top grill pan or saute pan. Preheat for 5-7 minutes. 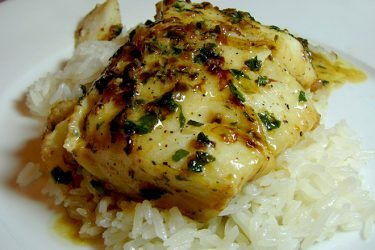 Drizzle pan with oil before cooking the fish. Cook as instructed. Keep sliced avocado green by storing a sliced onion in the same storage bag or container!